An example of a completed game. 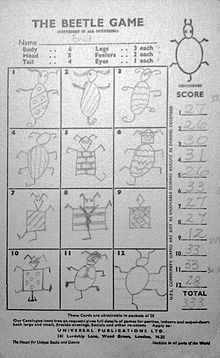 Beetle is a British party game in which one draws a beetle in parts. The game may be played solely with pen, paper and a die or using a commercial game set, some of which contain custom scorepads and dice and others which contain pieces which snap together to make a beetle/bug. It is sometimes called Cooties or Bugs. The game is entirely based on random die rolls, with no skill involved. 6 is for the body, of which there is one. 5 is for the head, of which there is one. 4 is for the tail, of which there is one. 3 is for a leg, of which there are four. 2 is for an antenna, of which there are two. 1 is for an eye, of which there are two. The part corresponding to each roll of the die, however, may vary depending on the rules established by the players. It is necessary to roll the correct number for the body before any other part may be drawn. To the body, one may attach the head, legs or tail, but the head must precede the antenna and eyes. The first player to draw all the requisite parts is the winner. Beetle has been converted to a commercial game called Cootie, and is also released under the name Beetle by Milton Bradley. Beetles are constructed as plastic models. There are some minor gameplay differences, such as there being no wings on the beetles.